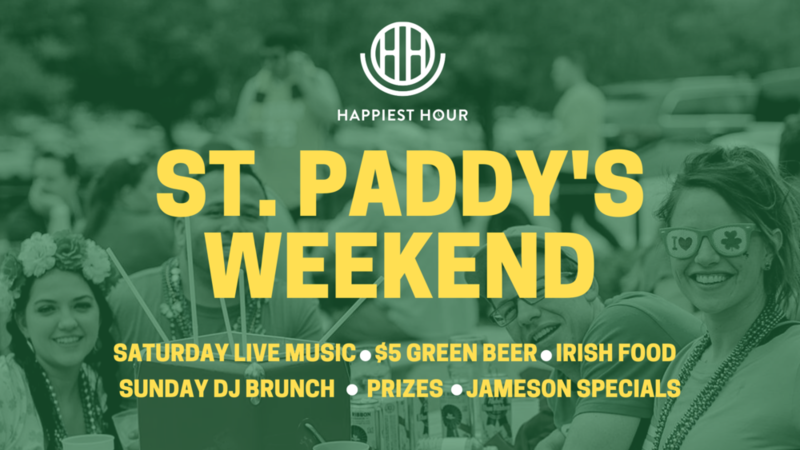 Luck is on your side this St. Paddy's Day as Happiest Hour throws the biggest party yet all weekend long! Specials begin on Saturday, March 16 with $5 green beer, Irish-inspired food specials, live music, and more! You have to see it to believe it or else you'll be GREEN with envy. Happiest Hour is the place to be this year, make your plans and see you for St. Patrick's Day. $8 Jameson Irish Whiskey Caskmates Irish Mule - Buy a Jameson Mule and get a ticket to enter into the Jameson raffle for your chance to win a YETI Cooler and more! Multi-bar access. Balloon drops. City views and champagne. DJs all night. Raise a glass to the happiest New Year ever at the city's largest patio bar and lounge located in the Harwood District! Happiest Hour hosts the ultimate New Year's Eve Megaparty that will start promptly at 9 PM. You'll dance the night away with two of Dallas' best DJs on the turntables playing all of your favorite jams from 2018. When the clock strikes midnight, everyone will toast to the New Year as the revelry ensues with more than 5 balloon drops 'til 2 AM. Tickets required for admission. No ticket, no entry. No refunds. 21+ only. VIP tables start at $1,500 and feature exclusive rooftop access and more. Learn more at happiesthourdallas.com and follow @happiesthourdal on Instagram. Watch the game and brunch with us! Happiest Hour's Game Daze experience features 25+ huge flat screen TVs, Shareable Team Eats + Drinks, $4 select beers, and an incredibly fun ambiance that's a total win-win. Whenever there's a big game, Happiest Hour is definitely the place to be. Hop over the hump every Wednesday with Happiest Hour's new $4 Craft Beer Day. Raise a glass to craft beer starting at 11:30 AM. We’ll feature a new brew each week poured in a limited-edition glass just for you. Happiest Hour's Game Daze experience features 25+ huge flat screen TVs, Shareable Team Eats + Drinks, $4 select beers, and an incredibly fun ambiance that's a total win-win. Whenever there's a big game, Happiest Hour is definitely the place to be. Smoked Saturdays adds an all-new element to Happiest Hour's 2018 Game Daze season. This over-the-top roster of good eats features Burnt Ends Sandwiches and footlong dogs perfect to pair with a $4 brew. Our smoked meats and the fixins are prepped hot and ready from our custom-built smoker. Get it while it's hot. And while it lasts. For an awesome Halloween bash on Saturday, October 27, Happiest Hour is sure to scare up some good times! Dress up or come as you are to a party that will feature a great time before the Kevin Hart show, a chance to win up to $500 in prizes, $5 select beers all night, and a dancefloor with a live DJ from 10 PM – 2 AM. We have big plans in store for the ultimate Rivalry Weekend. Sign up below to be the first to score the details. Happiest Hour is located <3 miles from Cotton Bowl Stadium. Sign up with your email address to receive news and updates on Game Daze at Happiest Hour. Great American Football returns! Join us at Happiest Hour, Dallas' largest patio bar and lounge, for the ultimate pre-game, watch party, and after party experience. Featuring 25+ TVs with sound, $4 domestic beers, $20 beer buckets, and specialty cocktails for the kick-off clash of LSU vs. University of Miami. Get ready to par-tee. Join us at Happiest Hour, the official AT&T Byron Nelson After Party featuring live music until 2 AM! Open to the public and complimentary to attend. Get ready to par-tee. Happiest Hour is the official after party destination of the 2018 AT&T Byron Nelson! Join us on our spacious downstairs patio or on our award-winning rooftop and enjoy our signature over-top-cocktails and incredible nightlife atmosphere. Dallas' best DJs hit the decks Thursday through Saturday from 10 PM - 2 AM. The fun begins on Saturday, May 12 at 9 PM AT&T Byron Nelson Kickoff Party After Party and continues through Sunday, May 20. Open to the public and complimentary to attend. Every time the Stars play at home, you score a special at Happiest Hour! Lucky for you, Valentine's Day falls on $4 Craft Beer Day at Happiest Hour. All day, we're pouring $4 Karbach Love Street and $6 signature Froze. Top your Froze with a tasty Codigo Tequila floater for just $3. Enjoy our Fat Tuesday specials when the Mavs take on the Kings! Party Gras is on at Happiest Hour!